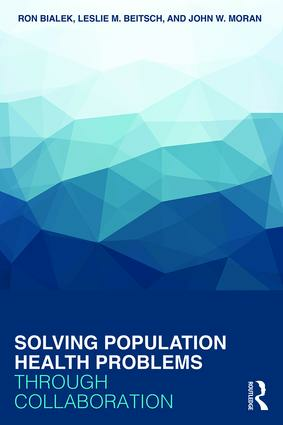 More than 50 population health experts have come together to provide key insights into how to address population health issues and challenges in a collaborative way in the new book, Solving Population Health Problems through Collaboration. This work, released in March 2017, is edited by Ron Bialek, Leslie Beitsch, and John Moran from the Public Health Foundation (PHF), who share a combined 80 years of experience in public health and population health. Rapid changes in healthcare and public health offer tremendous opportunities to focus on process improvement. Hospitals, public health departments, and their community partners are more often working collaboratively to solve population health problems and need guidance on how to use their community’s resources wisely. Through 27 chapters from population health leaders, Solving Population Health Problems through Collaboration details steps on how and when to take action on population health issues affecting communities to achieve results. This is the first book of its kind to provide advanced thinking from a wide range of experienced change specialists specifically for population health improvement efforts. Contributing authors include John Auerbach, President and CEO of the Trust for America’s Health; Kaye Bender, President and CEO of the Public Health Accreditation Board; Karen DeSalvo, Former Assistant Secretary for Health in the U.S. Department of Health and Human Services; and Allen Leavens, Former Senior Director of National Quality Forum and Principal Clinical Quality Analyst at MITRE Corporation. Solving Population Health Problems through Collaboration examines evidence-based intervention strategies, case studies in hospitals and health departments, health equity issues, core competencies, public health campaigns, step-by-step collaboration advice, and much more to affect real change. Designed to prepare population health workers in public health and healthcare settings to develop strategies for improved population health, this book is required reading for population health executives and staff in hospitals and health systems, health administrators, and public health professionals. PHF also offers sustainable population health improvement solutions facilitated by experts who have helped over 500 public and private organizations solve improvement and performance problems of all types. Recognizing that hospitals, public health departments, and communities have unique characteristics, PHF’s experts customize their approach to accelerate change and fit with an organization’s culture and priorities. Learn more about PHF's approach to sustainable population health improvement. Ron Bialek, MPP, is President of Public Health Foundation, Washington, DC. Leslie M. Beitsch, MD, JD, is faculty at the Florida State University College of Medicine as Professor of Health Policy and Director of the Center for Medi­cine and Public Health. John W. Moran, PhD, is a Senior Quality Advisor to the Public Health Foun­dation, Washington, DC.